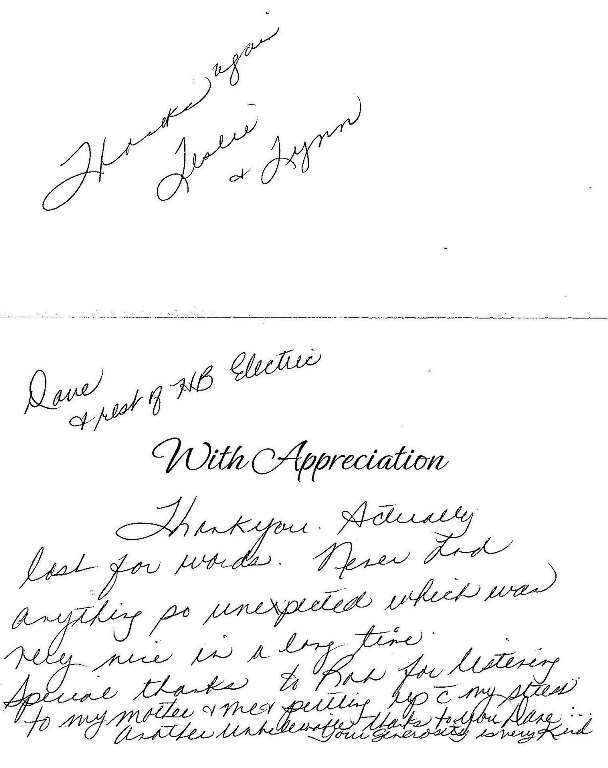 We would like to commend your company and your electrician, Rob, for the excellent service we received this week. We had help the very day we called and Rob was terrific. He was personable, informed me of exactly what was happening and what his plan was, and he seemed very diligent in carrying it out. 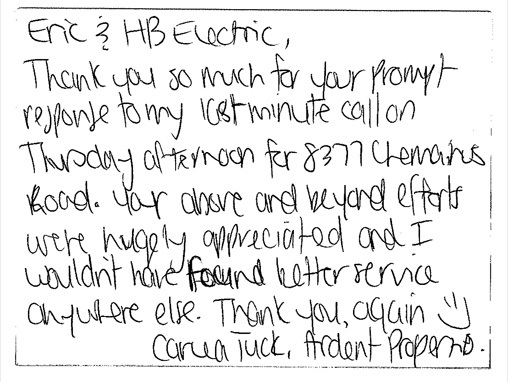 We were very pleased with your service! Thank you so much for your prompt response to my last minute call on Thursday afternoon for Clements Road. Your above and beyond efforts were hugely appreciated and I wouldn't have found better service anywhere else. Thank you. Actually lost for words. Never did anything so unexpected which was very nice in a long time. Special thanks to Ron for listening to my mother and me and putting up with my stress. Another unbelievable thanks to you Dave. Your generosity is very kind. On Friday I was in a bind with my water pump. I sought an electrician and after many phone calls I found you. I have just finished a major building project an had difficulty with several of the contractors. I wish I had found you sooner! Your company and staff are very polite and professional, your service is excellent and your pricing is fair. I will use your company for all my future projects. Congratulations to you and your staff. Over the long week end a fuse on the power pole outside the building blew up, thereby wiping out power to the building, although with the three level system there was power intermittently. No birds or squirrels were blown up that we could find (thats usually what happens). So what this means is that for many of you, your power will have gone on and off a few times and alarms sounded and fire alarms sounded like wounded dogs for awhile and lights worked sometimes and fax machines powered up and off a few times. Our electrician figured it out, powered down the whole building, called BC Hydro, waited with me for them to show up, they replaced the fuse on the power pole on Duncan St., checked the transformer by the building and then the electrician powered up the building, checked fuses and switches and declared it all clear and fine. And then I reset the timers etc, so hopefully the lights on timers will be normal, and the door lock is on a back up battery anyway so it should all be good. That said you may have to reset your electrical appliances, clocks and machines when you get into the building. Thanks to Dave at HB Electric for showing up as soon as I called, and to the guys at BC Hydro who were on call this long weekend. Have a lovely short work week. The two young fellows did a good job, they know what they are doing. I thank them for doing good work. Thanks for a job well done! Your guys are great. Very, very happy with Dave - fixed it instantly. God that Guy is good!!! Once again thank you to your crew for their service. On June 9th, I talked to Howard regarding some work that I needed done in my store. The job, to me, seemed like a big one, but that same afternoon there was someone at my store giving me a rough estimate and said, "oh sure, we can do that no problem". Sure enough, on June 16, two of your men showed up at my store bright and early with a sheet and outline what to do. The greatest part is this, I own a computer store, and was concerned about down time, having to have all of my repair benches turned off, and other such problems that can happen with electrical. In the 4 hours that they were at my store I didn't have one PC down, no interruptions in my day and the job was done to perfection. I couldn't be happier. It's the way my store should have been wired in the first place. Thanks again for the quick response, fast work and great pricing. Dave was the most knowledgeable and proficient electrician and fan installer. Compliments. Thanks for doing such a good and prompt job for us! copyright 2010 H.B. Electric Ltd.